The Faculty of Engineering signed a new inter-university exchange agreement with Universiti Teknikal Malaysia Melaka (Malaysia) and Parana Catholic University (Brazil) in FY 2010. 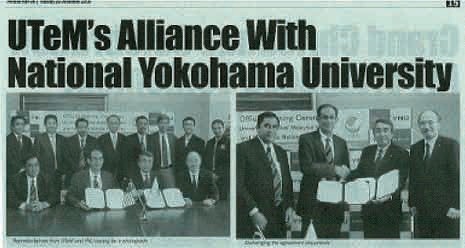 A signing ceremony for an agreement between the Universiti Teknikal Malaysia Melaka, (UTeM: http://www.utem.edu.my/) and Yokohama National University took place on December 6, 2010 in Yokohama. As shown in the photo, six people including Vice Chancellor Hassan (as the University Chancellor is royalty, the Vice Chancellor is the de facto Chancellor) visited Japan (Photo 1). UTeM is an engineering college located in the City of Melaka with about 8,000 students, established in 2000 as the 14th national college in Malaysia. As the history of the college is recent, teachers without doctorate degrees are now enrolled in the doctoral program at YNU Faculty of Engineering (at present 4 people), deepening a cooperative relationship. The event was big news in the local press, whipping up the expectations for the results of our exchange (Photo 2). Kawamura (DenDen Net) has traveled to Melaka as an External Examiner for UTeM three times. 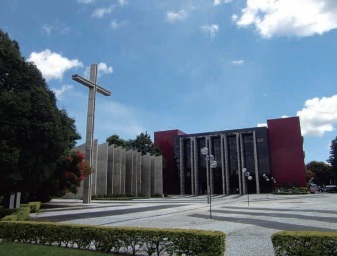 Parana Catholic University is a large-scale private Christian university with the official name Pontifica Universidade Católica do Paraná, located in the Federal Republic of Brazil, in Parana’s state capital city Curitiba. Curitiba is a city known as the ‘Environmental Capital’ ever since it held the Earth Summit Curitiba in 1992, gaining world-wide fame in the implementation of advanced urban policies. The city basks in global attention as the sustainable city that implemented, one after another, novel policies toward problems particular to developing countries such as the influx of the poor to cities, environmental issues, social welfare issues, and transportation problems. Some well-known examples include the project to separate and purchase garbage from poor areas, and the urban transportation network that fully utilizes buses. Parana Catholic is the university that turns out great numbers of talent who spearhead the advancement of these policies. At Parana Catholic University, a graduate-level urban management major started in 2010 that is interdisciplinary and accepts foreign students from overseas, primarily from countries in South America. Premised on this new trend, YNU Committee for Founding the Graduate School & Faculty of Urban Innovation led the efforts to conclude the Inter-University Exchange Agreement in December, 2010, with an eye to expanding the alliance as far as to such related interdisciplinary disciplines as engineering, economics, business administration, education and human sciences, environment and information sciences, social sciences from an international perspective, and others, without shifting the emphasis from urban-policy fields. Parana Catholic University has had no ties with Japanese universities other than the 20+ year exchange relationship in arts and nursing with Kurashiki University of Science and the Arts and its sister schools, thus we are convinced that having established an alliance with a leading university in the model progressive city of Curitiba will be of great advantage in terms of YNU’s internationality, progressiveness and practicality.